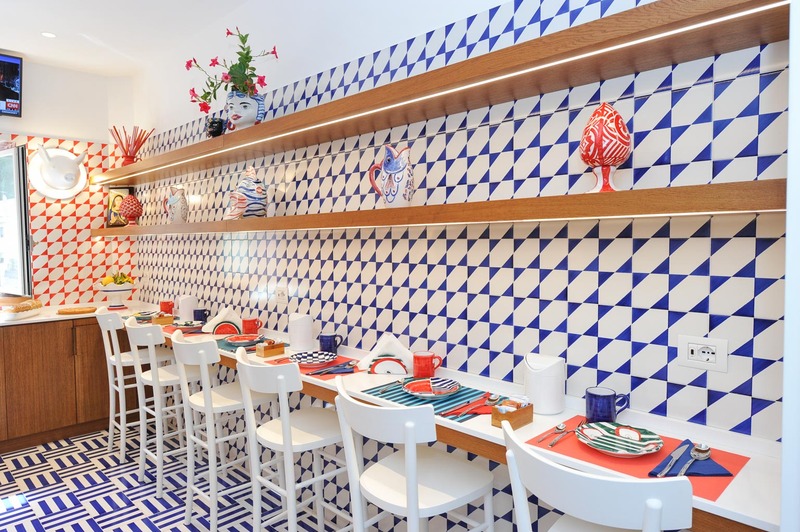 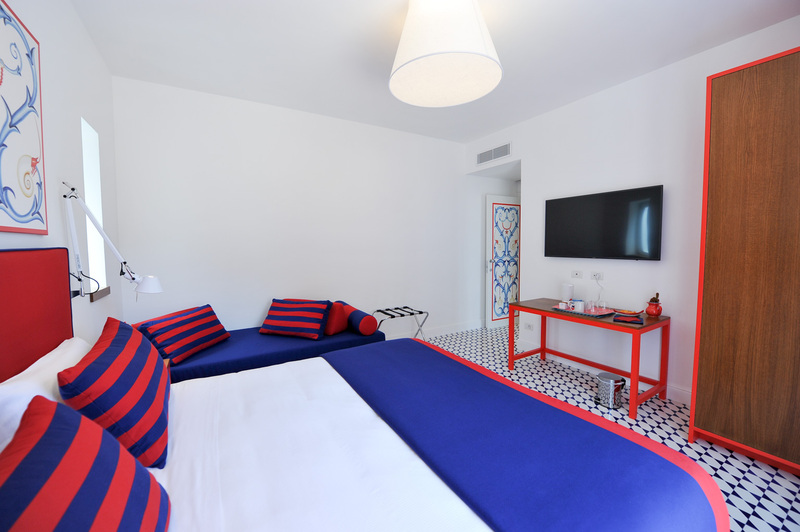 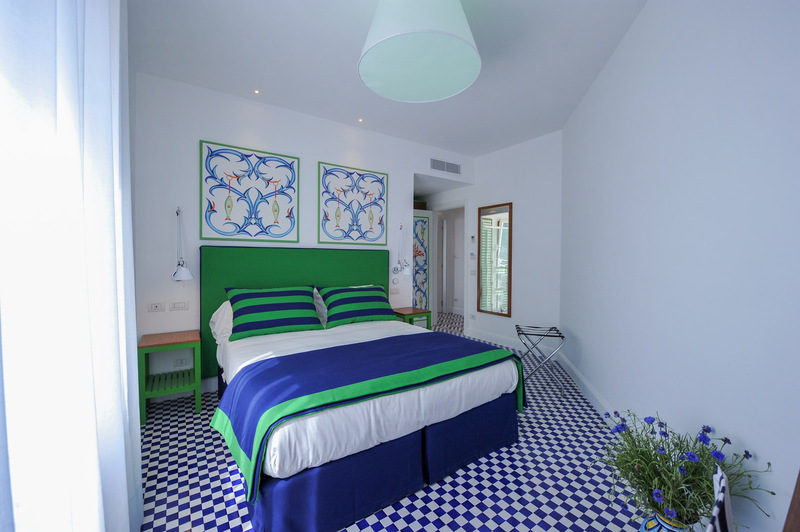 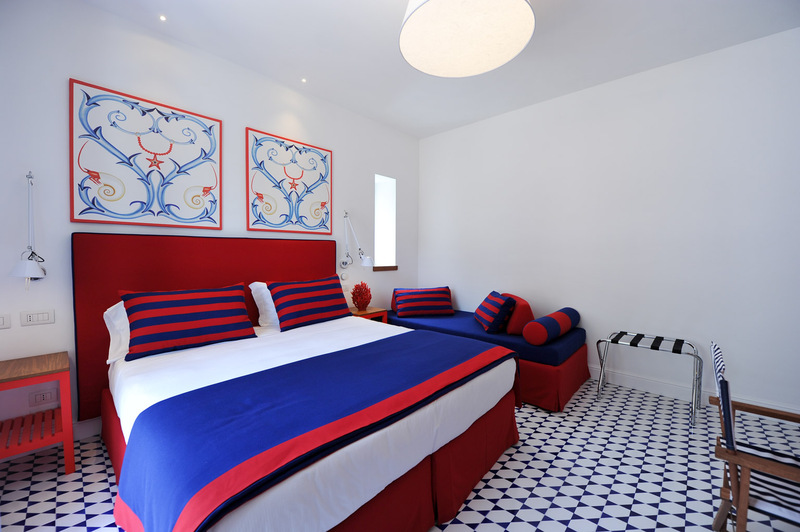 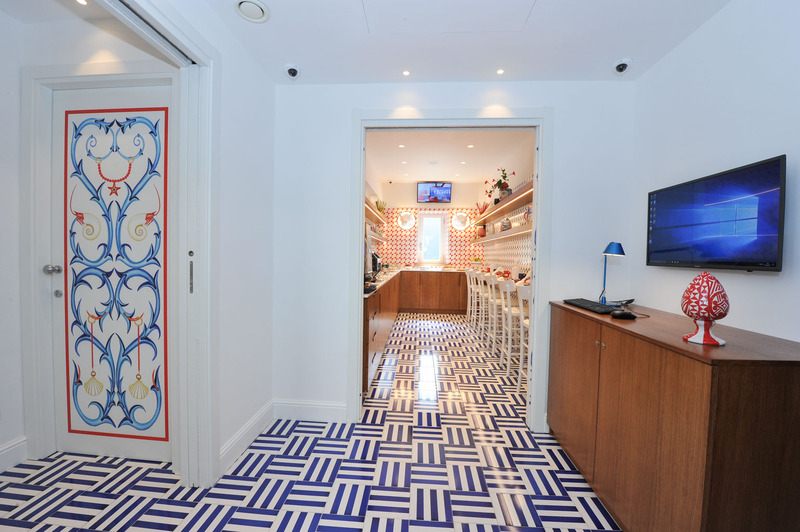 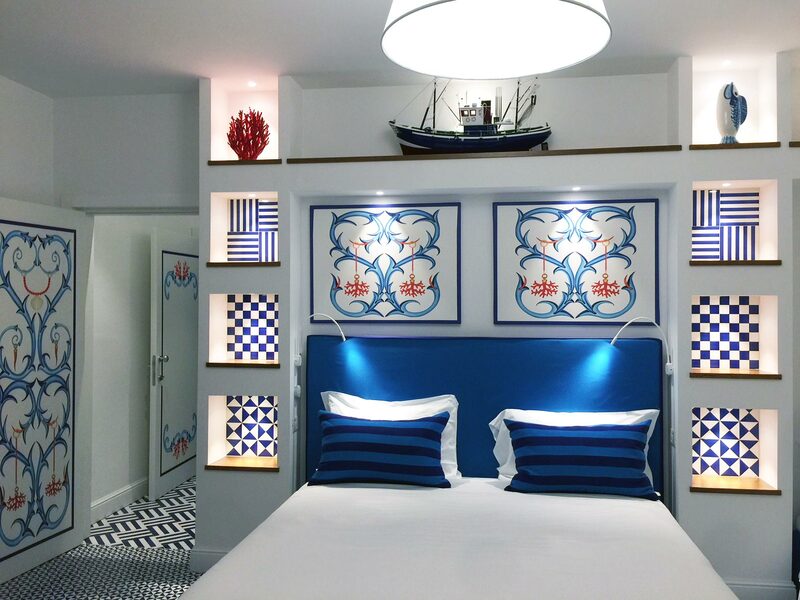 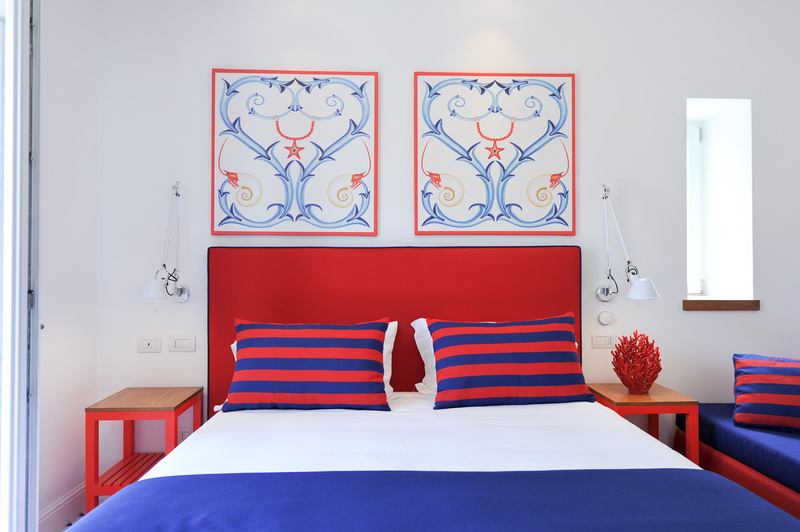 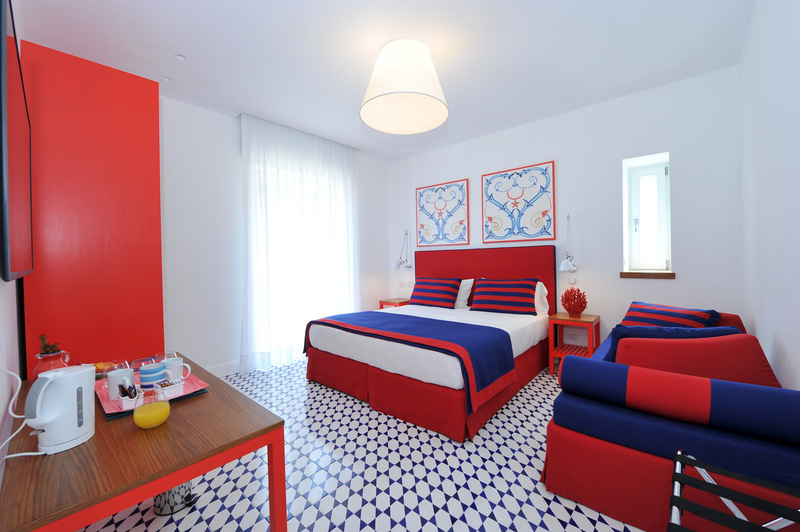 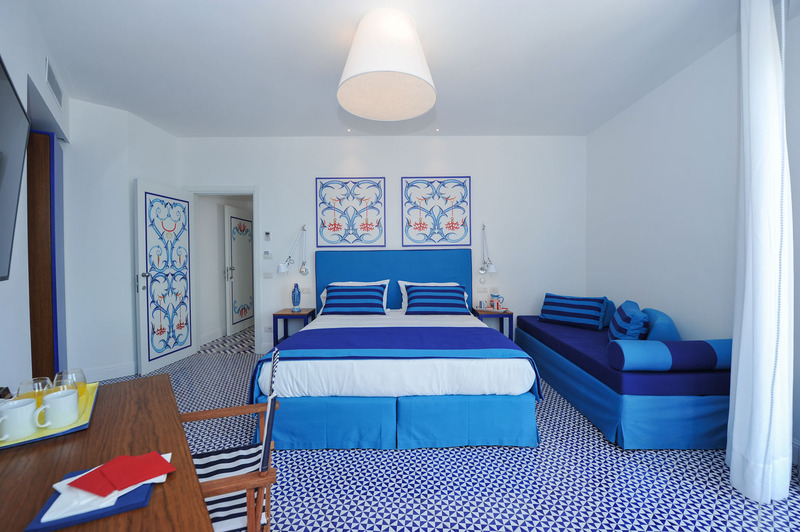 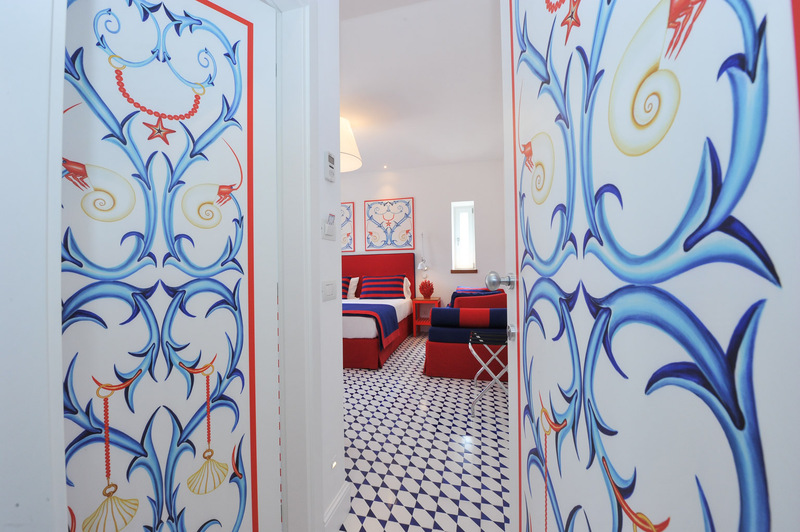 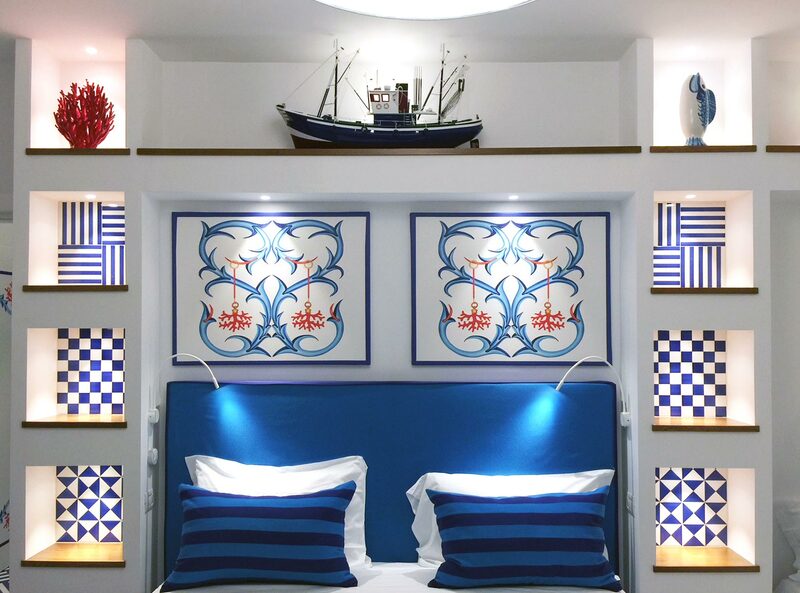 Halfway between a modern and a traditional style, Maison Lauren rooms have been decorated with a selection of the finest hand-painted Vietri ceramics. 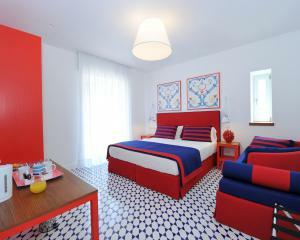 An ecstasy of colors and sensations that will make your stay even more enjoyable. 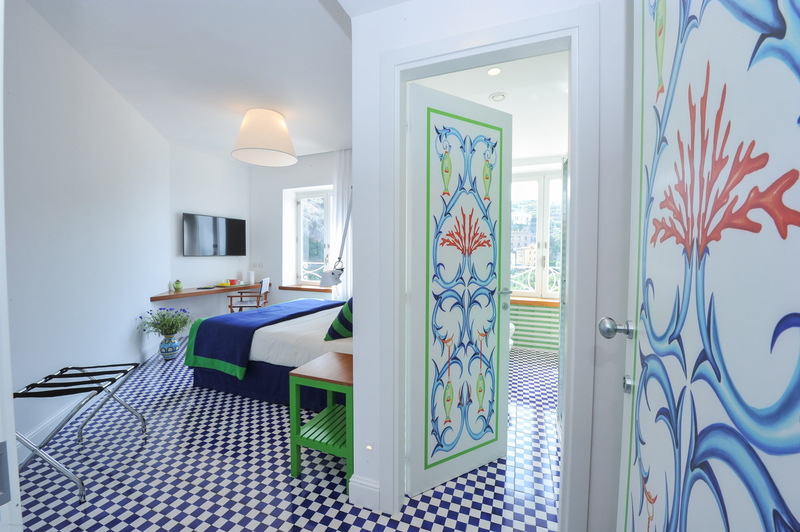 The rooms are cured in every detail: from the oak wood furniture hand painted, up to the wallpaper made of fine fabrics and hand-sewn. 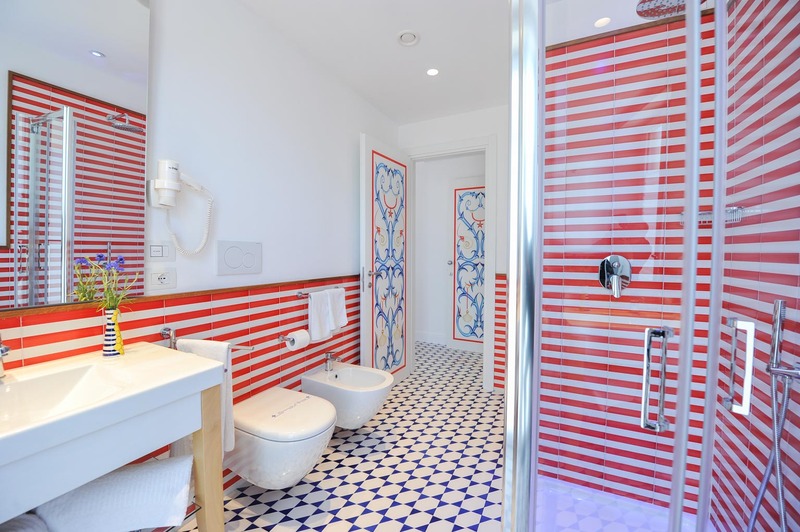 In addition there’s also a full optional bath, including chromotherapy, as well as air conditioning that is also available in the rest of the apartments. 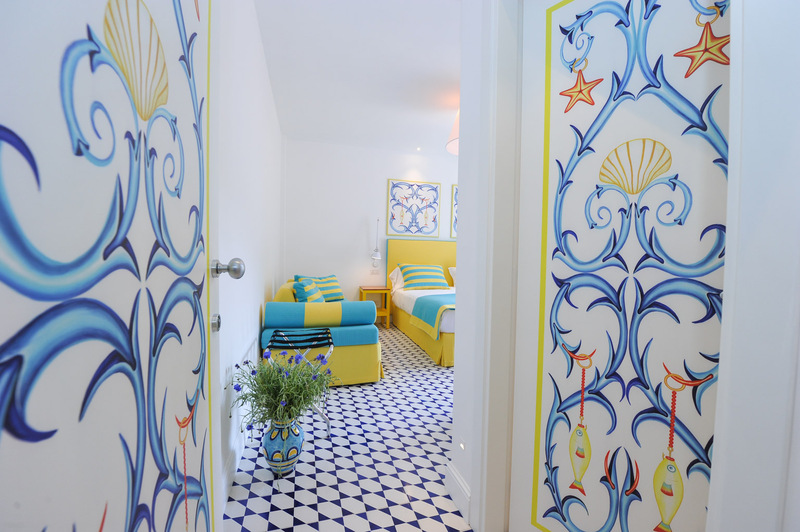 To make the scenery even more unique, the doors of the apartments were painted by Rosalinda Acampora, a Sorrentine artist who decided to illustrate the Mediterranean art. 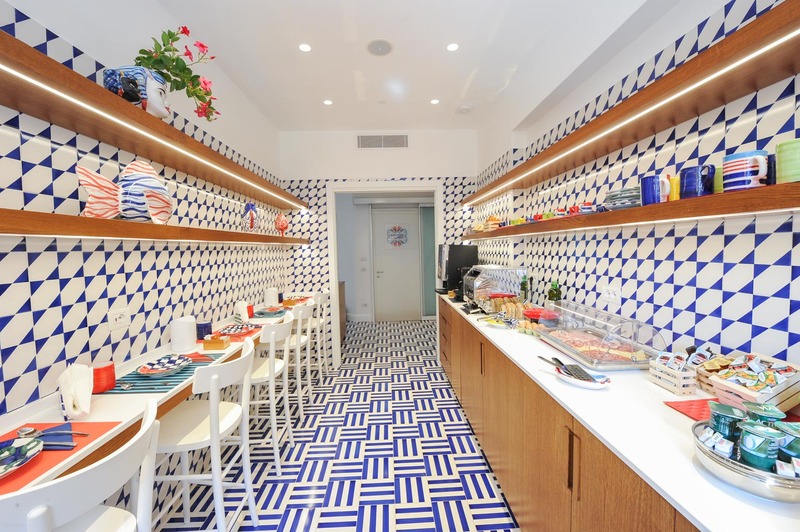 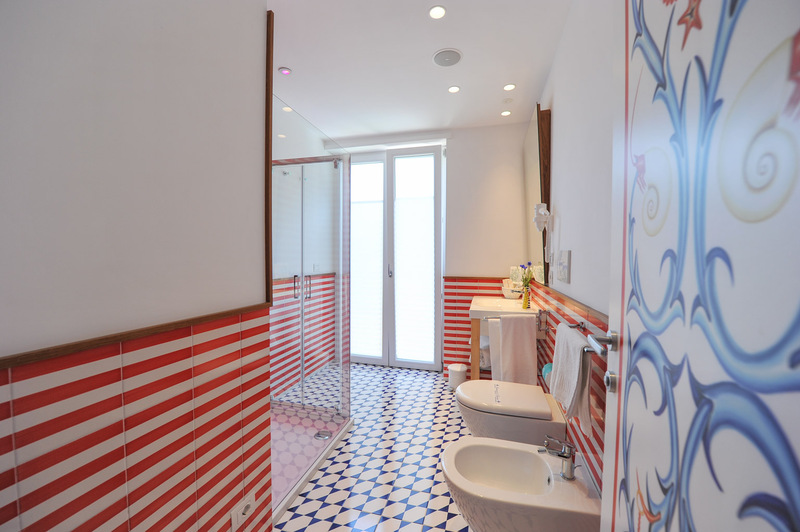 One of the two largest rooms of the structure, thanks to a width of 25 square meters. 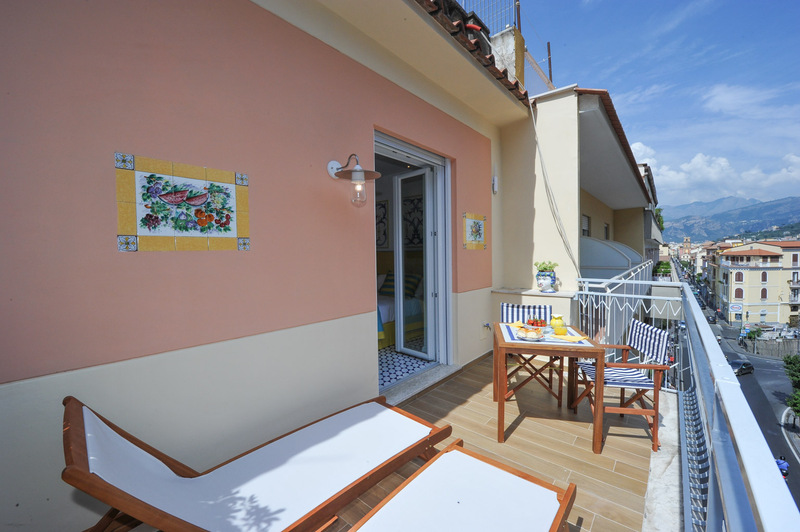 It is the ideal space for a maximum of 3 people with a double bed and another single bed. 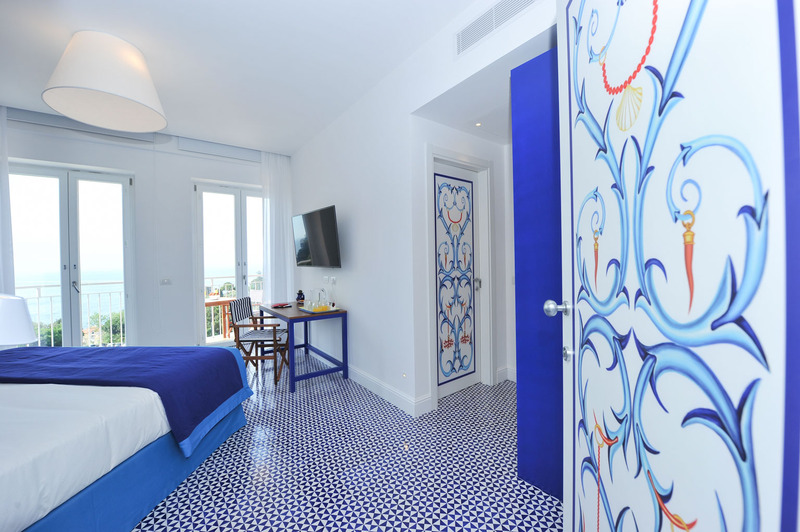 The room has a terrace with breathtaking sea-view, on the Gulf of Naples and Vesuvius as well as all the comfortable services offered. 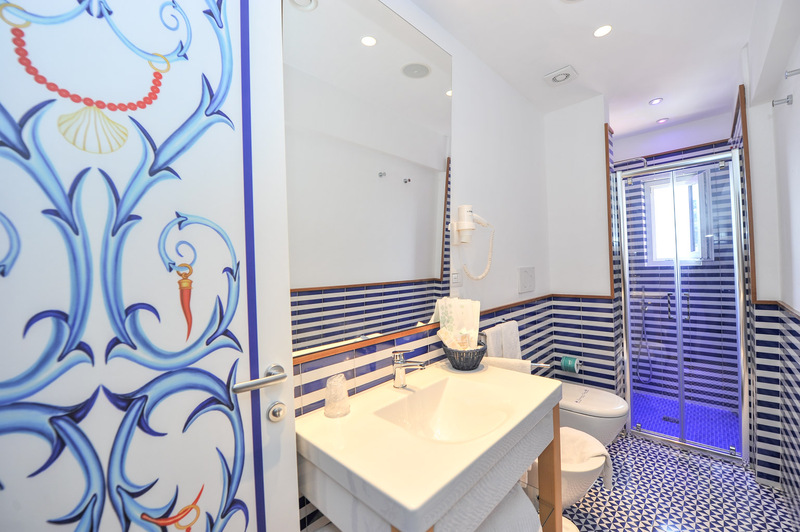 The full comfort is also guaranteed by a private bathroom with air conditioning, as the rest of the apartment, and sound system, chromotherapy showers, wall-mounted hairdryers and large mirrors. 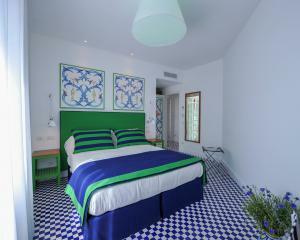 One of the two largest rooms of the structure, thanks to a width of 25 square meters. 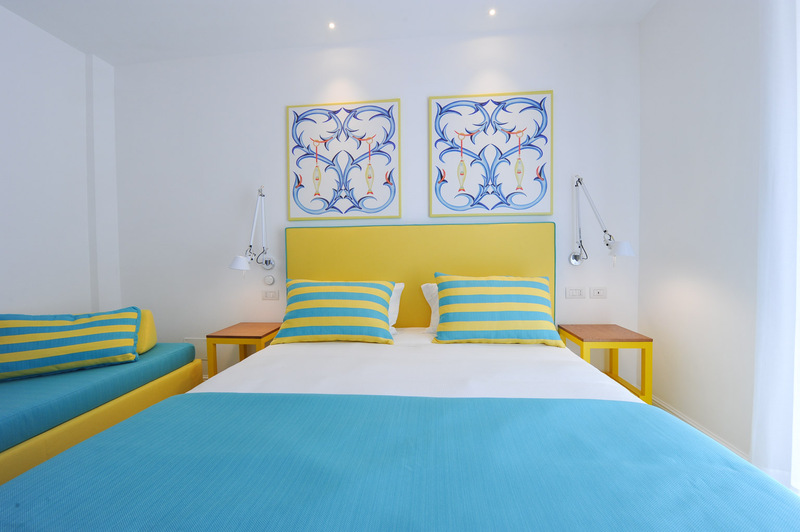 It is the ideal space for a maximum of 3 people with a double bed and another single bed. 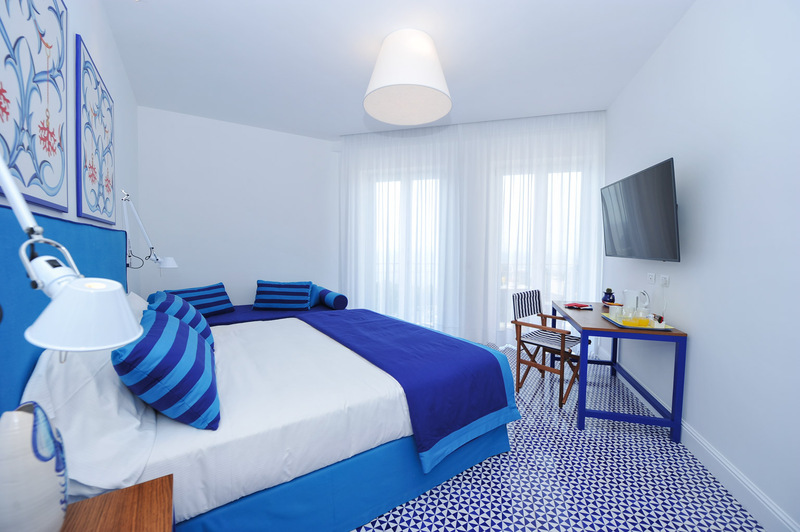 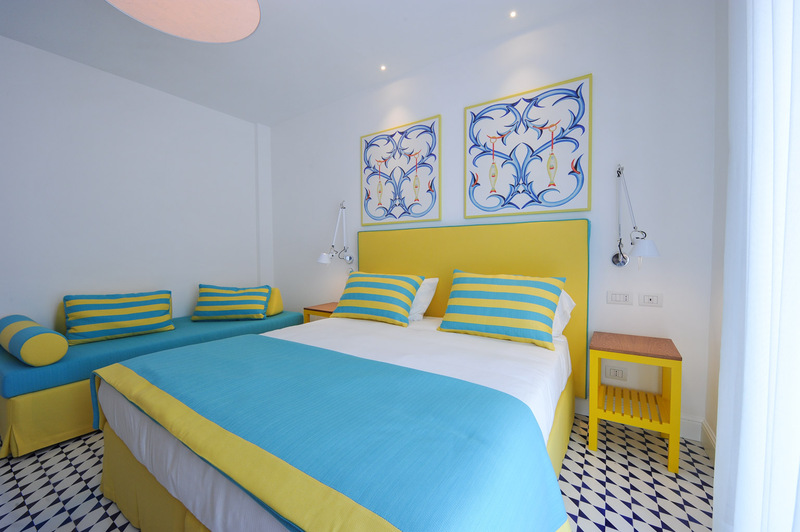 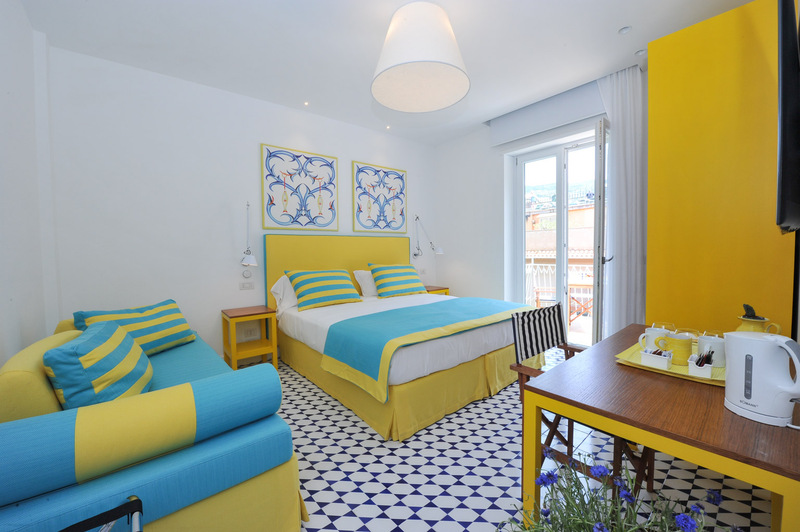 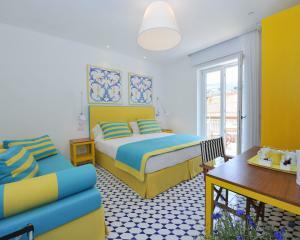 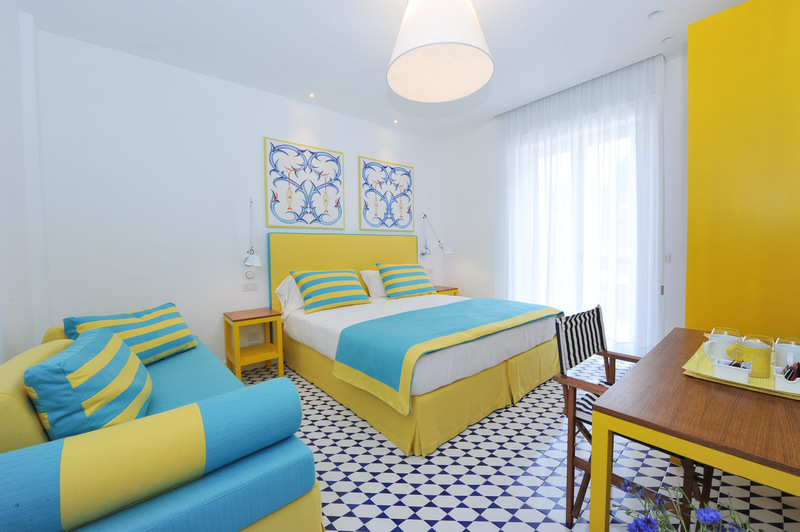 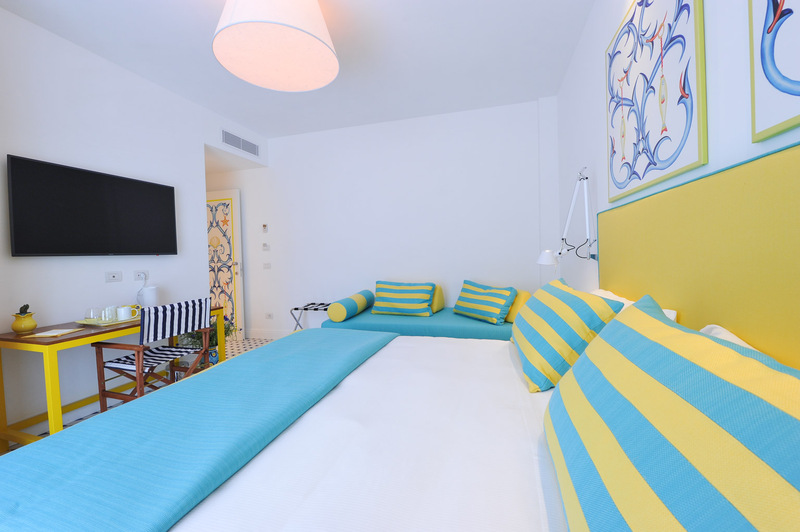 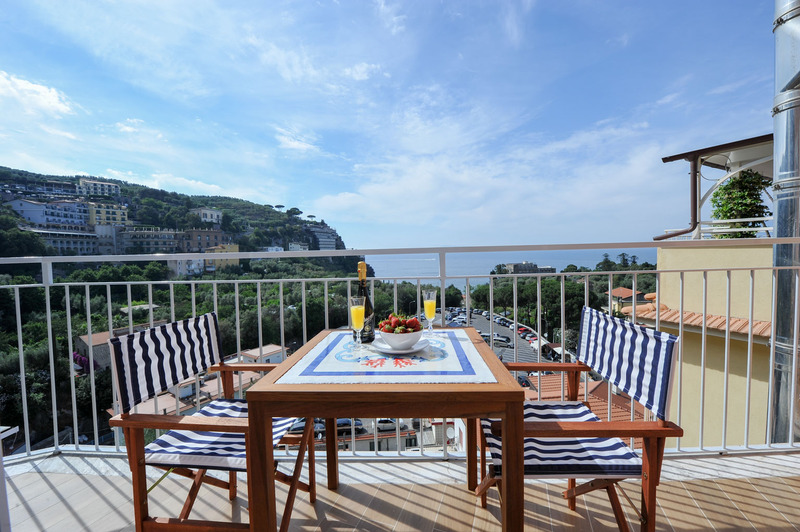 The room has a terrace with breathtaking sea view and Sorrento's main street as well as all the comfortable services offered. 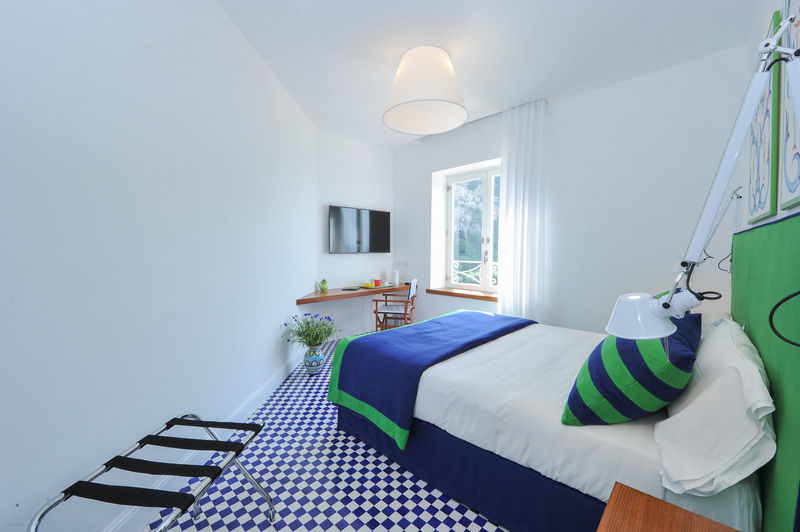 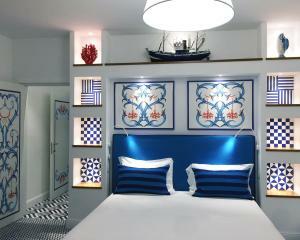 A lovely 22 square meter apartment that can comfortably host 3 people, thanks to a double bed and another single bed. 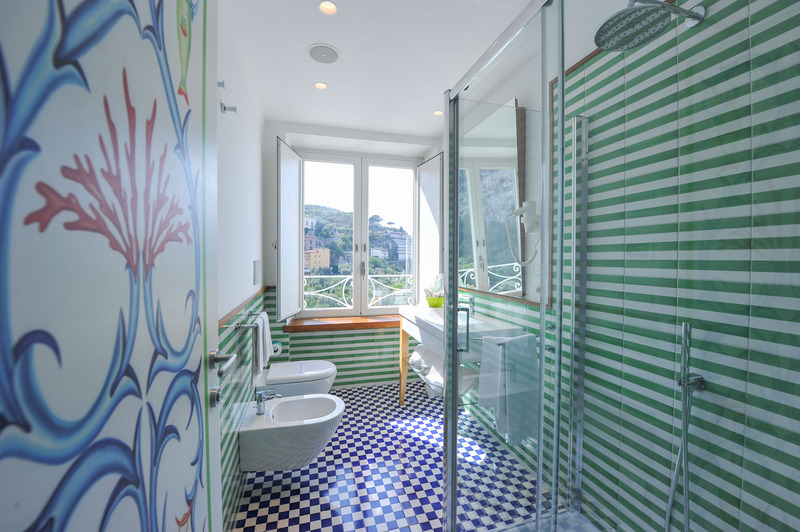 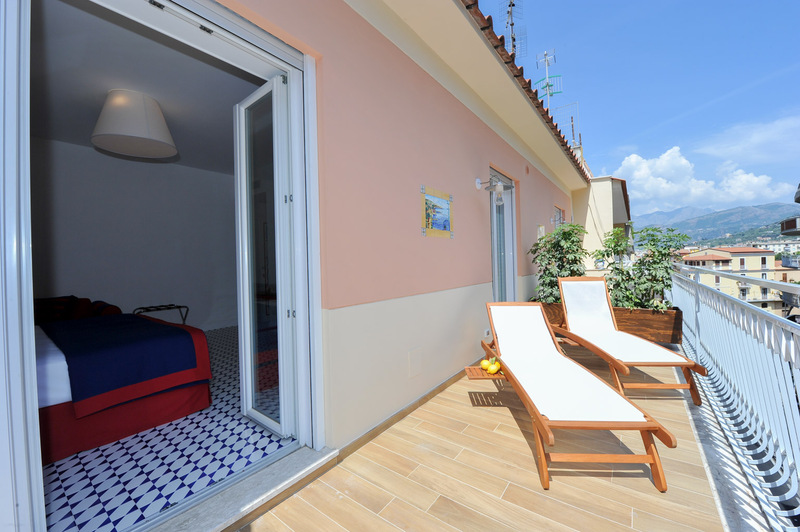 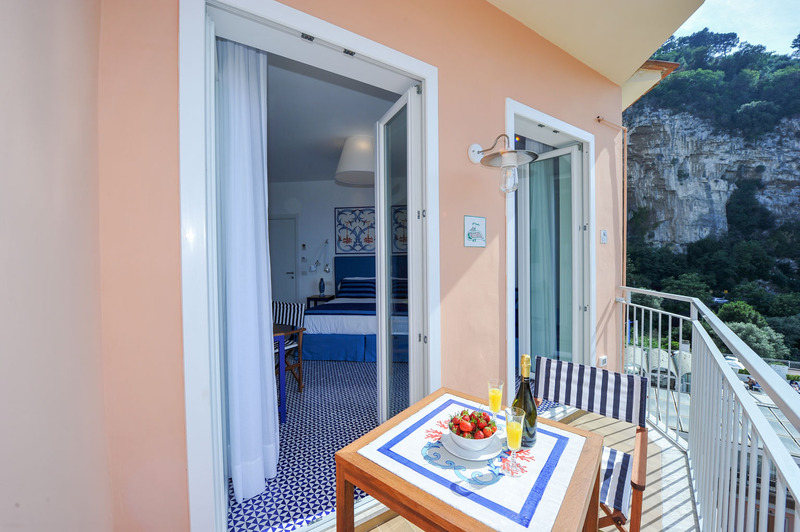 In addition to all the amenities offered, guests who choose this option will be able to take advantage of a private terrace overlooking the main street of Sorrento. 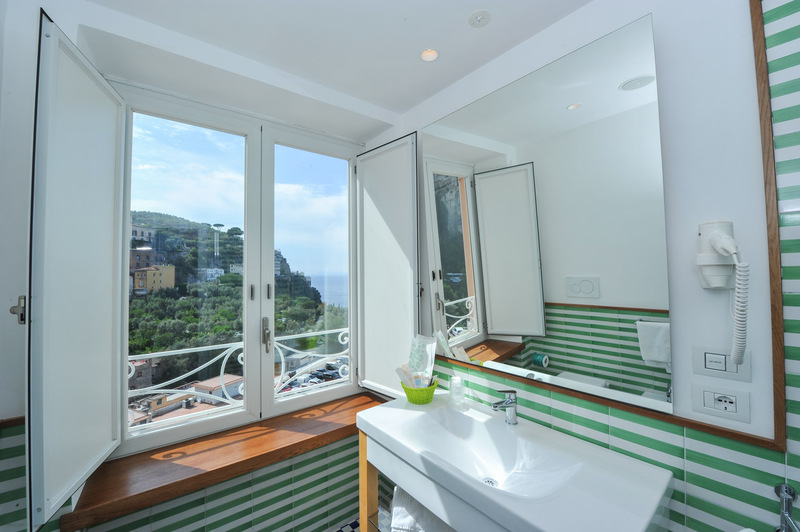 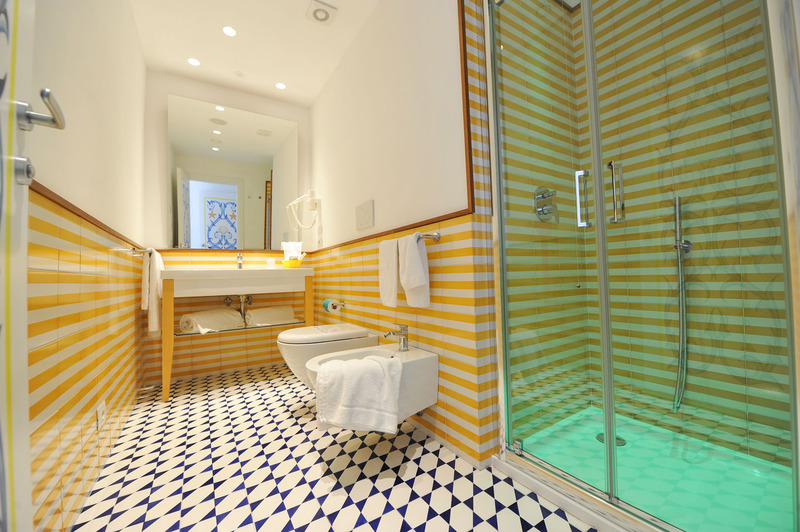 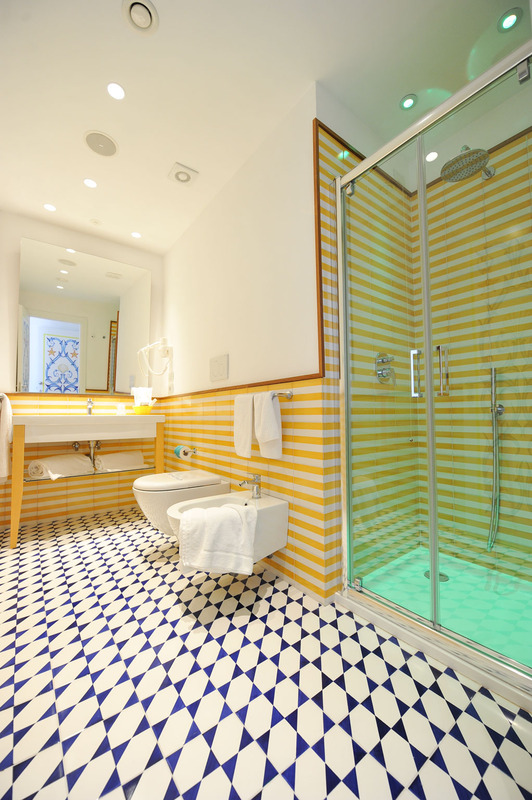 The room comfort can also be enjoyed in the bathroom, where air conditioning is available, as in the rest of the apartment, together with sound system, chromotherapy showers, wall-mounted hairdryers and large mirrors. 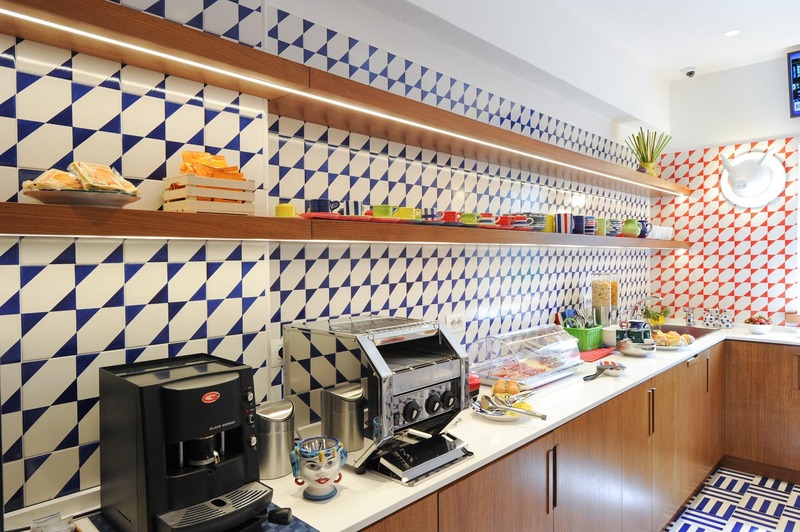 An apartment of 20 square meters detail-cared. 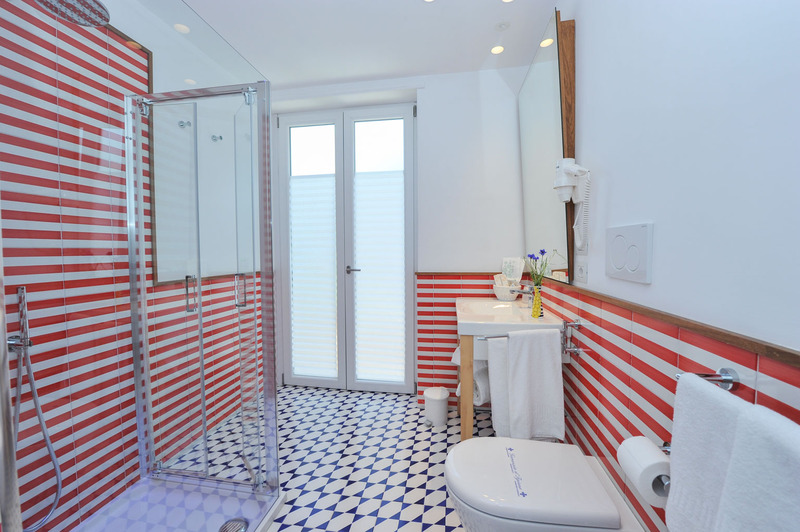 A space that guarantees the ideal intimacy between two people, who will be pampered by all the comfortable services provided, such as a full optional bathroom, with air conditioning (available also in the rest of the apartment) and sound system, chromotherapy showers, wall-mounted hairdryers and large mirrors.